So Pittman leased two additional levels in the same glass tower, bringing total square footage to 75,000, and reached out to a technology whiz, his Burning Man buddy Michael Beneville of the art and design consulting firm Beneville Studios. Beneville, in turn, helped select Brad Zizmor and Dag Folger of Architecture + Information. Their marching orders were to strip everything, then leave it essentially raw. “No dropped ceilings. No marble. No smoke and mirrors,” Folger recalls. The underside of rough waffle slabs is usually on display, and existing concrete floors were either coated with epoxy or polished and sealed. “Battleship, not cruise ship,” a laughing Beneville says, as he pauses by a metal anchor jammed in a concrete structural column. Elsewhere, columns are still tagged with fluorescent construction paint. Pittman judged them cool. As Zizmor explains, “It’s not a negative. We love the ugly.” Besides, he notes, sandblasting them would have added $10,000 to the budget. Standing out against the roughness, almost in defiance, are tidy, self-contained architectural interventions, painted fiberboard pods in various sizes for a variety of functions. The café on each of the three levels occupies a pod that’s white on the outside and either red or blue on the inside. Both ends of the café pods are open, with further ventilation provided by perforated panels on the sides. Other pods, ranging from single-occupancy telephone booths to a 16-seat conference room, have glass fronts surfaced with frosted film. If the company expands to another city, this kit of parts is ready for a rollout. The telephone booths rise from the middle of runs of benching workstations, which often terminate with a glass-sided private office. Through the glass wall, it appears that the workstations’ shared desktop continues to become the top of the desk inside. “Everyone is rowing the same boat,” Zizmor jokes. Shared desktops also appear in the boardroom. Here, banks of them flank the conference table, set beneath a canopy’s gently radiused form in painted gypsum-board with a glowing center in stretched fabric. This light-filled environment contrasts with a darkened sales presentation room right out of the movie tron. To launch the audiovisual programming, someone just waves an arm through one of the colored lasers beaming down from the ceiling to the conference table. “We used to spend 20 minutes convincing clients that we could be innovators,” Pittman notes. Not anymore. The room’s ceiling-mounted robotic arm, salvaged from an automotive plant, then chromed, can likewise trigger the lasers by waving above the table. More techie equipment fills the soundproof studio that IHeartradio personalities occasionally broadcast from. The studio overlooks an atrium that’s “layered to perform many different functions at once,” Folger notes. Small confabs take place in pairs of lounge chairs by the windows, alongside the void created by removing part of two floor slabs. Descending through the void, stadium seating faces a small stage—this is where Folger recalls Neil diamond playing an intimate set. Behind the stage, a digital video screen is truly giant, scaled after one of the company’s billboards. Beneville’s masterpiece is the interactive entry sequence. “We have to summon the ghost,” he announces. Magically projected video, first of a frosty Coke bottle, then of Ryan Seacrest, appears on a curtain of fog that emerges from jets as visitors exit the elevators. “We built the whole place as a storytelling device,” Beneville explains. Parting the fog, visitors encounter a veritable tunnel of radio love, where they themselves serve as a sort of tuning dial while striding toward reception. That’s because passing bodies trip the invisible infrared beams that emanate from fixtures installed just a bit above the floor, every 12 inches or so—technology borrowed from automatic garage door openers. 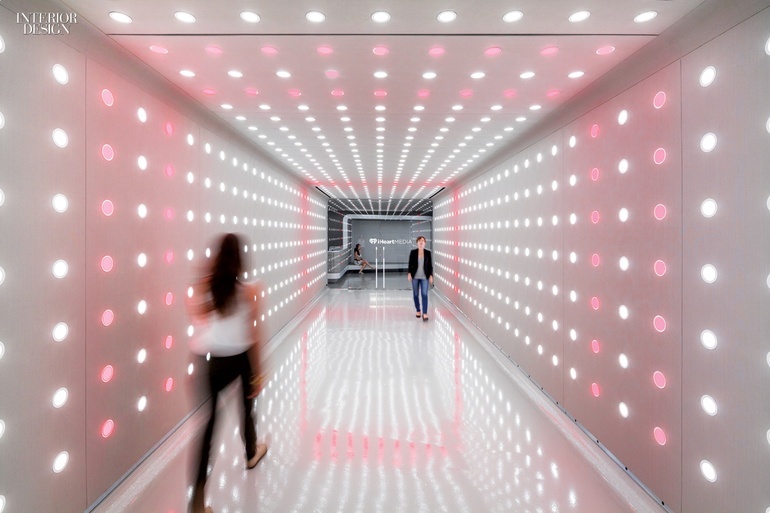 The interrupted beams instruct the sidewalls’ vertical rows of white LEDs to shift temporarily to red and hidden speakers to start playing successive channels of streaming live audio sourced from IHeartradio stations: top 40, urban, country. The result is a blur of sound that, if you pause, can resolve into a single, intelligible audio line. The effect so impressed voluble talk show host Steve Harvey, on his initial visit, that he dropped to his hands and knees. Project Team: Todd Stodolski; Aaron Whitney; Tony Moon; Rachel Bullock; Alan Calixto: Architecture + Information. Camille Purdy; Shawn WaIte; Jackie Ivy; Rotem Shachar; Kevin Centanni; Henry Chang; Sean Crowley; Andrew Eksuzian; Eleonora Gomez BAAS; Ashley Baker: Beneville Studios. IC Technologies; Lighting Workshop: Lighting Consultants. BBH Solutions: AudioVisual Consultant. Thornton Tomasetti: Structural Engineer. Acoustic Distinctions; 3 BYte Intermedia: Acoustical Engineers. AMA Consulting Engineers: MEP. CW Keller & Associates; Midhattan Woodworking Corp.: Woodwork. Mistral Architectural Metal + Glass: Metalwork, Glasswork. J.t. Magen & Company: General Contractor.